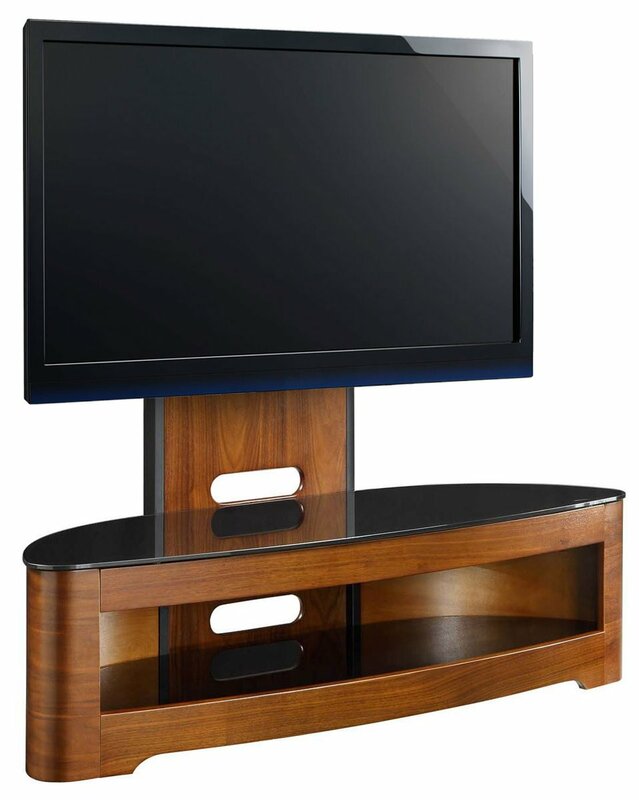 Crafted and Curved using Real-Wood Veneers, the JF209 combines flowing curves with Contemporary Design. Featuring spacious shelving and ultra Modern Hovering Effect Bracket, the 209 is remarkably unique. Includes Fixing Bracket for today’s Flat Screen TV’s. Maximum whole centres of 730mm by 430mm. Suitable for Screens 37” to 60"
Looks very stylish and easy to set up. Black glass really sets it off. Plenty of room for sky box, did player, sound bar etc. Not a real problem, but cable management could be better thought through. Also be careful when moving with tv attached,as it can try to tip over. Space between bottem of TV and shelf is 18.5cm. Hope this helps. Can this stand be placed in a corner? Yes we have puts in a corner. As well as my 42" Sony TV, could I mount an LG NB3520A soundbar on this too? Dont think you could mount it without drilling into the wooden back plate. It is thick enough and solid enough to take a bracket. Or it would sit on the top shelf nicely. 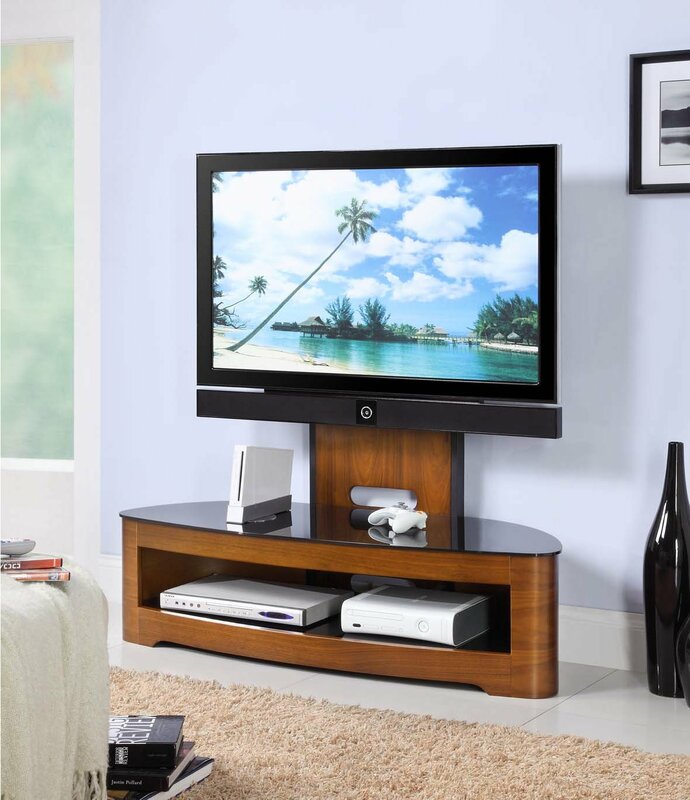 when the tv is to be fixed onto the bracket can the height of the tv once on be adjusted to suit. also are the fixings included to fix the tv to the unit. 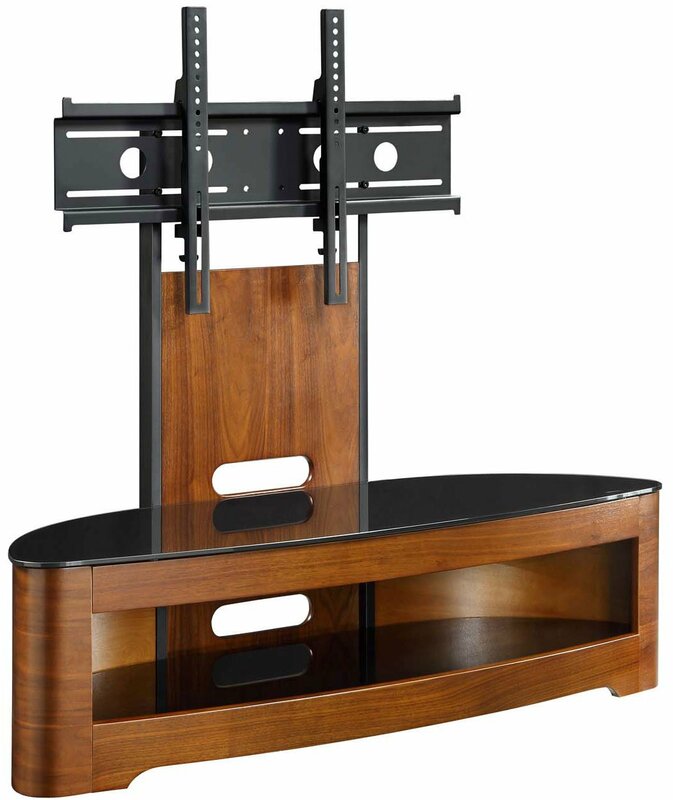 No you can't adjust the height when the tv is mounted to the stand but you can adjust the height of the bracket on the back of the tv prior to mounting to stand. No bracket mounting screws are provided so you will need purchase from a hardware store. M6 x 20mm is the size i think. Good stand though. You fix 2 upright brackets to the back of the TV, then the brackets hook onto the frame, which is then tightened. If you don't get the height right first time, which we didn't it is really easy to unhook it and reposition the upright brackets. We couldn't believe how simple it was to set up. So unlike most part assembled units. I can't remember if the screws were already inserted in the back of the TV and we just had to remove them to fix the brackets, or if we used the ones that came out of the TV's original stand. I know that from coming home from work we had it set up in about 30 minutes. if this unit is tight against a wall behind, how far off is the back of the tv please. also when is it available? Allowing for the bracket on which the TV is mounted, it's about 3"
As you know, there are various shades of oak and walnut. I have mahogany and walnut in my sitting room and the stand blends in very nicely between the two. I have 2 oak doors in my sitting tion and the stand looks lovely next to them not too light and not too dark - a really stylish piece of furniture.